You could almost hear the collective Democratic groan the instant Ralph Nader entered the presidential race. Not again. Not this time. Once again, he's going to siphon crucial Democratic votes and elect George W. Bush. Nader's full of himself. Hubris gone wild. Nader argues otherwise. Monday, at the National Press Club in Washington, the consumer advocate confronted his detractors in a slothful but substantive press conference. Treading upstream against a current of liberal criticism, Nader told the left wing to chill out. "This may be the only candidacy that is opposed overwhelmingly by those who agree on the issues," Nader said, telling liberals, in effect, don't worry, be happy. Why be happy? Nader says liberals will have another voice railing against President Bush, whom he referred to as "the giant corporation in the White House masquerading as a human being." In the 2000 presidential election in Florida, Nader won 97,488 votes, while Al Gore lost the state (and, therefore, the presidency) by 537 votes to Mr. Bush. In five other states this was also true. And it still haunts Democrats – from bar rants to national discourse. Leaning forward, speaking in a steady tone and with a determined look, Nader was unapologetic. His consistent retort is that no party owns a citizen's vote. At the press conference, he argued that there should not be a "two-party duopoly." And as always, he was pure populist. Nader referenced the "corporate crime wave" as the reason behind his "moral imperative to take a stand." He confronted liberal America, which united last week in an effort to get Nader to reconsider his decision to run for president. By Friday, his decision had leaked to the press. "I urge the liberal establishment to relax and rejoice," Nader said Monday. Very few liberals are rejoicing and Democrats are anything but relaxed. Although by all estimations Nader will not get the votes he did last time, Democrats are still fretting a sequel to 2000. This time, even left-wing crusaders beseeched him to stay out of the race. The Democratic Party urged the same. "Ralph, don't run," pleaded liberals to no avail. Sunday on CBS News' Face the Nation, Democratic National Committee Chairman Terry McAuliffe restrained himself. "I would hate to see part of his legacy being that he got us eight years of George W. Bush," an uncharacteristically reserved McAuliffe said. In their lead editorial on Monday, The New York Times had a retort of sorts: "We doubt very much that they (meaning liberal voters) will make the same mistake twice." There were few mainstays of America's liberal establishment more against Nader's 2000 run than the Times' editorial page. In late January, even The Nation magazine, a liberal icon and consistent leftist critic of the Democratic Party, asked Nader to sit this one out. "For the good of the country, the many causes you've championed and for your own good name – don't run for president this year," The Nation said. "Democrats should definitely be concerned because in a close contest, votes count," said Robert Shapiro, a professor of political science at Columbia University. However, Shapiro doubts Nader will get nearly as many votes as he did in 2000. "But I think it is more than Ralph himself," Shapiro continued. "There are voters to the left who don't think they are being well represented by the Democratic Party and not getting their views heard." Even with former Gov. Howard Dean's candidacy having pushed the Democrats leftward, the assumption of Naderites is that the Democratic Party will move to the center (to a fault, in their opinion) during the general election. 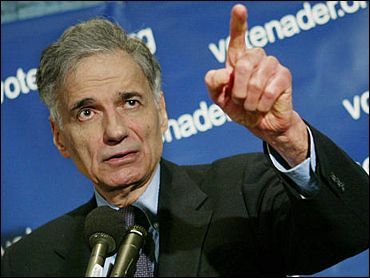 Mocking the liberal affront against his candidacy, Nader used a whiny tone to describe his detractors as whiners. He said that if the Democrats won the White House back, liberals would cry, "Oh you can't believe, we are betrayed, the Democrats are succumbing to corporate interests." Bleating sardonically, Nader insinuated that the liberal complaints are feeble because the Democratic Party will disregard their progressive causes if its man sits in the Oval Office. Certainly, in the long general election to come, Nader will become less of a story. Nevertheless, united Democrats and all, Nader still commands a national presence. And so the question persists: Are there enough liberals out there whose frustration with the Democratic Party trumps their animosity for President Bush? Probably not. Not in the year of the Pragmatic Democrat. However, enough being the operative word, Democrats will wait and see if Nader siphons votes from their ticket in a crucial state, leaving them once more lamenting, "Nader the spoiler." Whether this will happen, no one knows for sure. But certainly, the Republicans hope so.